Deakin researchers have engineered the next generation of wearable technology, using strain sensing textile fibres to create clothing that keeps track of its wearer's movements. Deakin Institute for Frontier Materials (IFM) scientist Dr. Shayan Seyedin said the strain sensing textiles could be used to produce compression garments that monitor professional athletes during competition, or to allow patients to track and compile data while undergoing physical rehabilitation. The devices could also be applied to virtual and augmented reality technology, providing more thorough feedback and accurate movement within VR games and simulations. "Strain sensing textiles have particular relevance in the development of smart devices for health, sports, and soft robotics," Dr. Seyedin said. 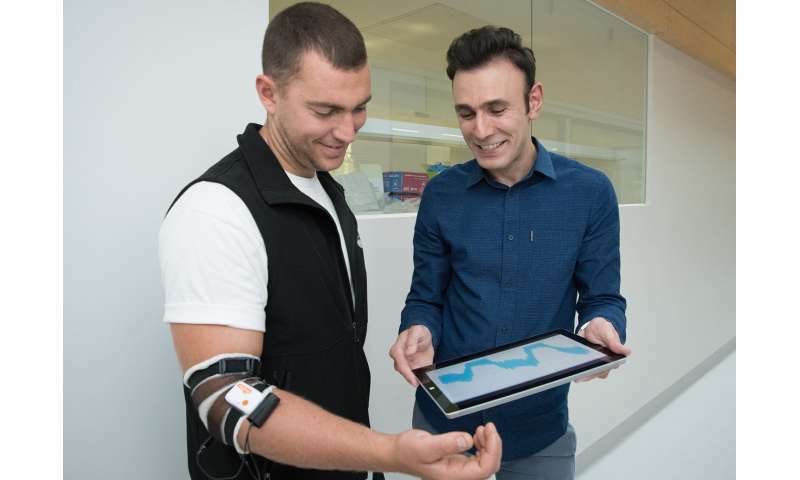 "These wearable devices can convert a wide range of body movements into electrical signals, making it possible to track and record physical activities such as those involved in fitness and health monitoring, improving exercise efficiency, injury prevention and rehabilitation." Most effectively applied to joints with a high range of movement such as knee, elbow and finger joints, Dr. Seyedin's knitted textile prototypes rely on conductive elastic fibres that stretch and relax during movement. As the resistance levels change, this information is sent to a computer monitor using a wireless transmitter chip, where it can then be recorded and used to provide feedback on body movement and biomechanics. Dr. Seyedin said this was the first time such technology had been scaled up to wearable levels, using standard industry processing and commercially available products to keep it affordable and accessible. "To date, there has been limited success in this area," he said. "The development of strain sensing textiles that can be worn directly – without the need for a supporting frame, substrate, or an additional clothing item – required significant advances in conductive fibre processing." Dr. Seyedin, whose previous work has focused on energy-storing "MXene" clothing fibres capable of independently charging devices, said the ultimate goal was to combine the two projects. "Textiles are integral to the clothes we wear for comfort and for fashion, and making them into intelligent input/output devices provides a new opportunity in extending their function beyond the traditional use," he said. "There are sensors out there that measure small changes and pressure, but the fabric we have developed measures large movements and strains of up to 200 per cent, and is wearable on its own without the need for bulky or invasive supports. "What we've demonstrated is an entirely new concept with the material that we developed specifically for body monitoring applications." The full research article "Continuous production of stretchable conductive multifilaments in kilometer scale enables facile knitting of wearable strain sensing textiles" is set to be published in the June 2018 edition of Applied Materials Today.